NEW! First Pullover receives a lot of inquiries from Start-Ups and Entrepreneurs. 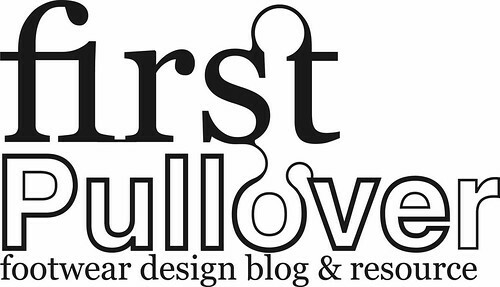 To help, please review this FAQ document from our Design Consultancy, The Directive Collective. Entrepreneur Concept FAQ - "I Want to Start a Footwear Brand - Now What?" A last is a generalized anatomical representation of the human foot shape. Created from a data set and functional requirements specific to a sport, a desired look, or an athlete, a master last is created from which production copies can be made. Production lasts are made from either turned (lathed) plastic, or sandcast aluminum. The Last is First. Click the Read More link below for a review of the processes involved in making both plastic and aluminum lasts. This series covers the full scope of production processes. 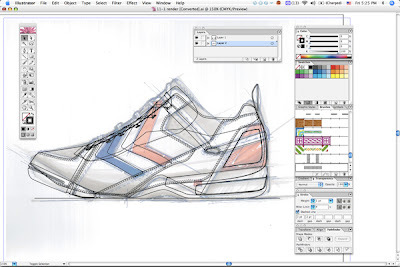 While the manufacturing production process might vary depending on the design of the shoe (ie. 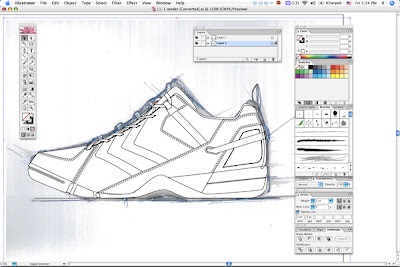 if it is a football boot or running shoe), and the specifics of each step in the process may be done in a slightly different way from factory to factory, the general process and steps involved is the same. 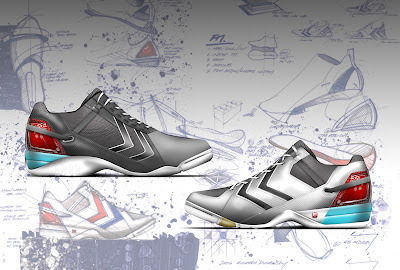 Click the Read More link below to view the the production process of the hummel 4.2 Concept FGC football boot, produced in China. Click the Post Titles below for each part in the series. 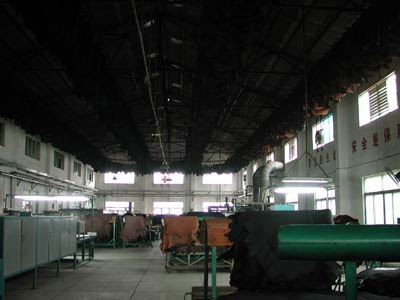 While in China I had the opportunity to check out a leather tannery that produces cow and kangaroo finished products for many top brands' performance and lifestyle footwear. 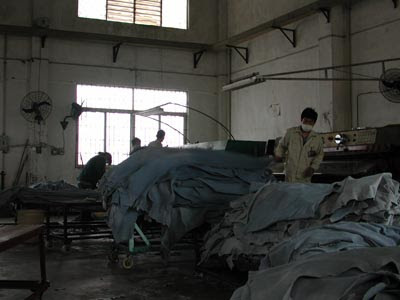 This particulary tannery doesnt process the raw hides, but rather recieves them in "wet blue" form from local manufacturers or imports skins from Australia/New Zealand (kangaroo leather) or Europe (cow leather). 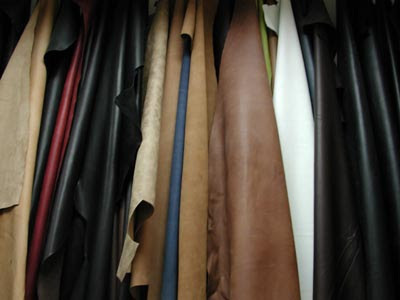 Click the Read More link below for more pics and info about the leather tanning process. A "wet blue" is a semi processes skin, that is indeed, both wet and blue. 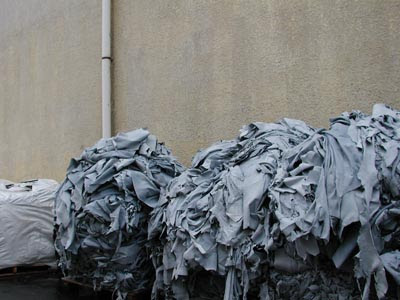 The wet blue skin is a result of a chrome tanning process that is done after raw hide is fleshed and the meat and hair is removed and is designed to keep the skins soft and ready for further processing and free from bacterial growth. Once the wet blue skins are recieved, they are first soaked in water to soften the skin. Then they go through a process called "semming" (not sure about the spelling of this, anyone have the correct term? ), which pushes the water out of the skin, but keeps it soft to work with. 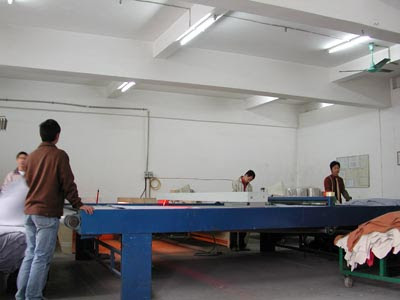 Skins are then "shaved" using a special machine that has a fine sandpaper like roller, which makes the skin (especially the bottom surface) more smooth and even. After this, the skins are split to the correct thickness by being put through a machine that has knife edge which can accurately split the skin in crosssection. Skins are then graded and measured. 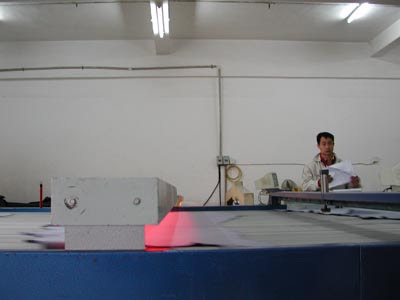 Measurement of processed skins is done using a special table that hasa computer controlled laser system which can determine the square footage of the particular skin and add the quantity to inventory. 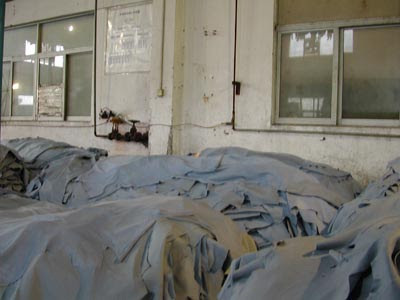 After the wet blue process, the skins can then be drum dyed, to set a color or finish. 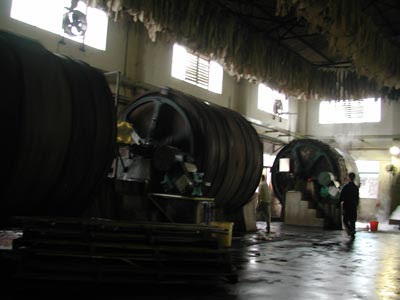 The drum dying process involves putting the skins in giant drums along with various chemicals and dyes. A typical skin may go through 4-5 different 40 mintue cycles of dying with different chemicals for a 6 hour total process. 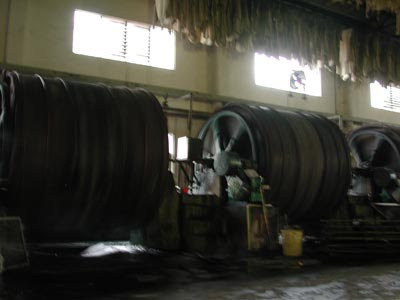 Some special finishes can take up to 12 hours of drum dying. 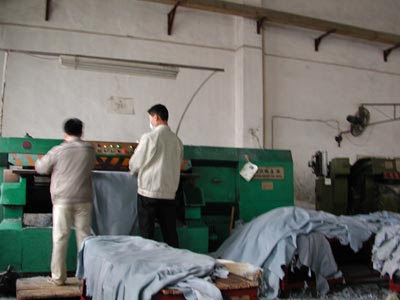 Skins are then air dried for 2-3 days depending of the temperature and humidity inside the factory and can take up to 1 week in particularily cold or wet weather. the the above and below photos you can see the skins hanging from the ceiling on a conveyor system to dry. While every designer has their own method for Photoshop renderings (and I'm by no means an expert), I do get a lot of requests for the process that I typically take to create a presentation rendering. I've put together a little tutorial to show the steps I use. Click the Read More link below for all 6 parts of this tutorial. 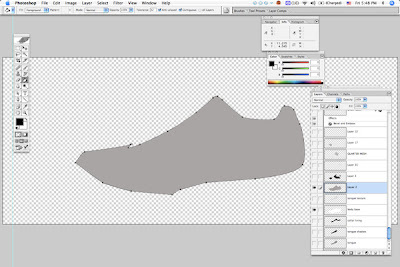 To start with, I make do a sketch of the shoe I am going to render to use as an underlay. The more in proportion and accurate this sketch is, the easier it is to do the required line art which will be used as a template for the rendering. 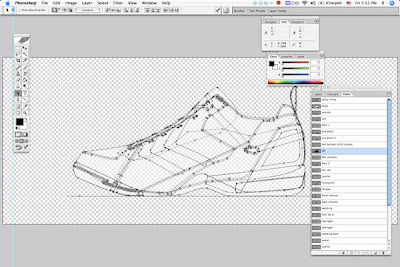 Using illustrator, I place the scanned sketch in a layer and dim the image (under layer > properties). Then using the pen tool, I draw over the image, making frequent use of the pathfinder (cut, intersect shape areas, add to shape areas) tools. This line art can then be cut and pasted into photoshop. I cut and paste the same artwork twice. Once as a Path, and once as pixels. The paths are used as cutting paths and masks for the rendering, and the pixels just give a good quick easy overlay/underlay to the rendering so you can see whats going on. From the path palette, you can select (using the black arrow path modifier tool) different parts of your work path (I usually rename to "All", or something like that). Once you have part of the body shape you want (I start with an outline shape that is whole upper), you can cut and paste that path to create a new path (renamed Body). This path can then be selected (the little button at the bottom of the Path palette with the dashed line circle), and you can make a new layer to start painting into. As I work, I find it important to keep my layers and paths well organized and named (instead of "Layer 38"), so its easy to find them later. By the end of the rendering I typically end up with something like 30 paths and 60 layers, so having some meaningful name helps a lot. Once you have a new layer, and a selected area, you can use the paint bucket tool to paint a solid color base for your rendering. A to Z of footwear technical terms, construction methods, part names, and more. To remove material by a sanding or roughing process. 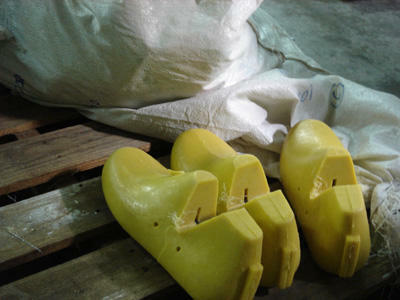 For example, EVA midsoles are buffed before assembly to help break the smooth surface for better adhesion to the upper. 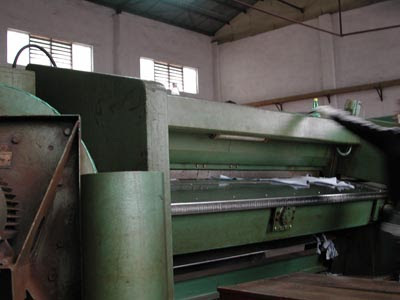 A lasting process where the insole board (carboard or texon) is inserted onto the last bottom and the lasting margin (excess) material of the upper is lasted onto the board and cemented to the insole board. Shoes of this type are usually more stiff and heavier. A nonwoven reinforcement material that is impregnated with a chemical hardener that sets with application of heat or another chemical. Used commonly for counter or toebox reinforcement. Compression Molded EVA. A foamed midsole material that offers good cushioning and compression set. The opening area of a shoe at the top. 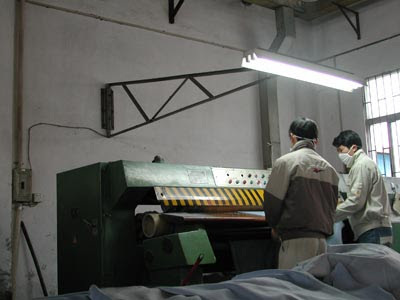 An type of non-woven upper lining and reinforcement material used commonly on cross training and hiking boots that provides a stiffer (compared to Tricot) lining and support for the shoe. The back/heel of the shoe. A hole through which you lace up a shoe. The part around the lace opening (throat of the shoe). Can feature webbings, eyelets, etc. Firm Ground. Refers to football/soccer boots/outsoles designed for use on hard, natural surface. The bottom part of the lasted upper. The process of stretching the preassembled upper around the last, by machine or by hand. The upper material part that when lasted folds over the edge of the last onto the bottom, overlapping the insole board. The component of a shoe between the upper and outsole used to provide cushioning, fit, comfort and support. The bottom component of a shoe that provides grip and traction. An upper part which is over another part. Refers to foam or other material usually inside the collar or tongue to add thickness/cushioning and improve fit. 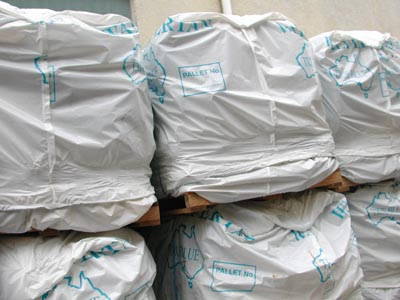 PU upper materials usually use a thin layer of PU foam with a non-woven or fabric backing for reinforcement and strength. PolyUrethane. Synthetic (plastic) material with minute bubbles or cells and a skin like surface. Used for upper materials, and in a different form for midsoles or padding foam. A prototype sample for checking pattern and fit. The side of the shoe. Can have many subcomponents and parts. Soft Ground. Refers to football/soccer boots/outsoles designed for use on soft (wet) natural surfaces. Stock Keeping Unit. A unique model/style/colorway/size. Commonly used to refer to a unique colorway. Ie, if there are 2 models each with 5 colorways, there are 10 SKUs total. A lasting process where the insole board (usually canvas) is stitched around the last bottom edge to complete the upper. Usually used for more lightweight, flexible shoes such as running shoes. Special Make Up. A special request by a customer (ie. distributor, retailer, etc.). It is normally just a different colorway of an existing shoe, but in some cases can also be a whole new shoe. There is not much more to it, really, just that it is requested directly. In some cases it may be part of a special marketing campaign (ie. one of those "exclusives" for Foot Locker you see), or might just be a product to better serve a particular niche covered by the market demographics, location, etc. (ie. maybe some country/market sells more brown colored shoes, but there are none in the main collection). A seam which is stitched to join two parts then flipped inside out so the stitch is hidden. Upper part on the toe, usually and overlay. Part which covers the top of the foot. Usually a separate component stitched inside the shoe at the bottom of the throat. Thermoplastic PolyUrethane. Synthetic (plastic) material usually used for molded details and components on a shoe such as a molded eyestay, logo, counter reinforcement or waist stabilizer. 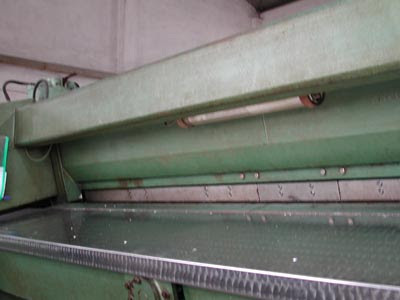 Upper lining material, usually used on running shoes that is made from a sandwich of mesh type fabric, that allows a lightweight, breathable construction. Refers to football/soccer boots/outsoles designed for very hard/round natural surfaces like dirt or turf and also synthetic grass surfaces. A part of a shoe upper that is under another part. The part of a shoe created around the last. Area of the shoe/last on the front/top.